As the title may indicate, we have news. We have received a call from the Daily Mail this evening in which they have confirmed that article is definitely going to run in tomorrow’s edition. Please tell all your friends to tell all their friends to buy a copy (plus an extra copy for others who might have forgotten!). 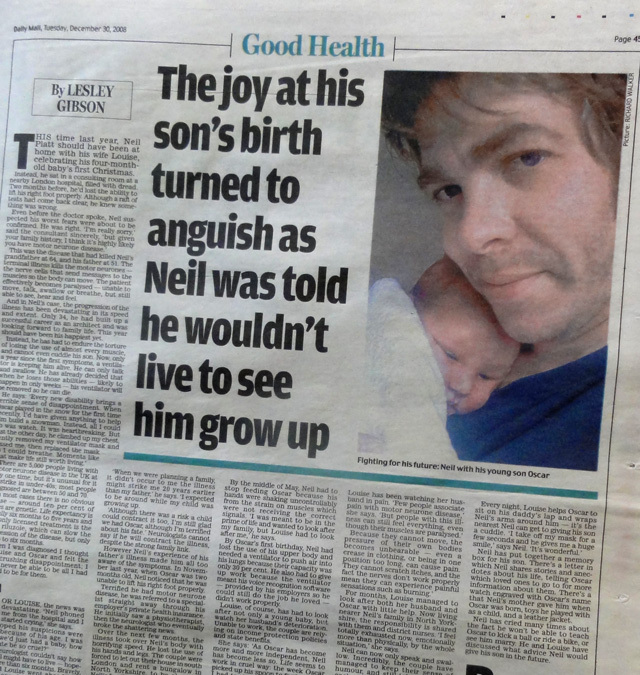 There were times of laughter in our house, and for Neil, this had certainly been one of them! Neil barely made the pee bottle one evening, as I tried to make good a disastrous trip to the hairdresser with a home dye kit. Unhappy with the strawberry blonde colour from one hairdresser, I had gone to a second one who made me look worse. My hair had been bleached so blonde that I felt it looked like I had a lit torch permanently attached to my head. Unwilling to risk another expensive bill I decided to walk out of the hairdresser and straight in to the nearest pharmacy to get a home dye. As I emerged from the bathroom, with now orange hair, Neil’s laughter was uncontrollable as he knew he had lined up the photographer for the Daily Mail to come to the house the next day. Between my hair colour and heavy make-up I had used to cover up the dose of conjunctivitis Oscar had brought home from nursery for me, I was barely recognisable. → Next post: A breath of fresh air or a foul gasp?